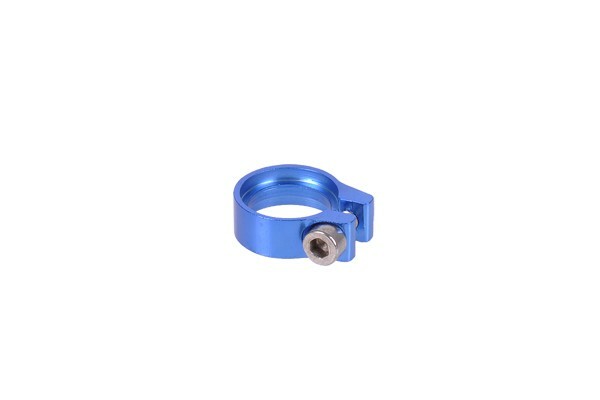 Hose clamp for secure fixation of hoses on barbed fittings without a union nut. A larger inner diameter is the great advantage of barbed fittings over compression fittings. The disadvantage of these fittings is the fact that no additional fixation for the hose is in place. For this purpose these hose clamps with a hexagonal socket screw are perfect! Simple to install, available in many colours and optically very appealing! Please note: Should you use the hose clamp on barbed fittings, please note that the barbed fitting expands the outer diameter of the tubing by 1-2mm compared to the outer diameter of the tubing when not installed on a fitting.